For those of you looking for more free overnight parking and urban camping, some bars and casinos around the country offer that free option. Below we have listed all the bars and casinos offering free overnight or extended parking by state for your convenience. Keep in mind that most Casinos charge for overnight parking, so we focused on just the free ones in our research for your convenience. Grab a drink or put some coins in a slot machine while you’re there. Have fun and enjoy your free urban camping spot. 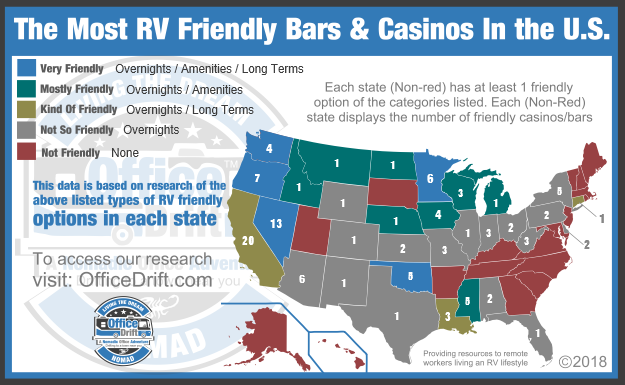 Check out our FAQ: What is free bar and casino camping? If you know of a spot that I may have missed, be sure to let us know so we can add it to the list. Be sure to call ahead to any of the locations you find in our lists. Some places may be full, changed policy, seasonal, or closed for renovations/repairs.